The Homer Yacht Club, Inc. is a nonprofit organization founded in 1983, to further education in the art of sailing and in boating safety. Activities are suited to either individual or family participation. Although owning a sailboat is not required for membership, the Homer Yacht Club is designed for sailboaters and those whose primary boating interest is sailing. The Homer Yacht Club sails primarily on Kachemak Bay, on the west side of southcentral Alaska's spectacular Kenai Peninsula. Approximately twenty miles long, Kachemak Bay encompasses several islands, bays, and coves flanked by towering mountains. Marine wildlife is abundant, with seals, sea lions, sea otters, porpoise, whales, and numerous species of pelagic birds. Whenever I find myself growing green about the mouth; whenever it is a damp drizzly November in my soul; and especially whenever it requires a strong moral principle to prevent me from methodically knocking peoples hats off -- then, I account it high time to get to sea. There is nothing surprising in this. If they but know it, almost all men in their degree cherish very nearly the same feelings towards the ocean with me. 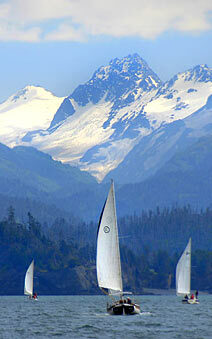 The City of Homer and the surrounding area has a year-round population of about 12,000. The boat harbor, serving both the recreational and commercial fleets, is located on the Homer Spit, which juts four miles into Kachemak Bay. The recreational boating season generally runs from mid May till mid September, though many hardy souls stretch it from mid April into October, and even longer. The mean high temperature in the summer months is 62 degrees, with water temperatures around 46 to 53 degrees.